Here at Stephanie’s Kitchen Garden this week we will be watering our crops, paying particular attention to our garlic and asparagus. Despite a very wet winter, we have had lovely dry warm weather of late which has dried out the soil. April is a crucial month for garlic as the bulbs are forming ready for harvest in a couple of month’s time. Plenty of water now will help the bulbs to swell to a good size. It will also help prevent rust from setting in. Asparagus is about to start peeping through the soil and here at Stephanie’s Kitchen Garden we are awaiting this with anticipation as it is our first year of harvest. The plants have been given a feed of fish, blood and bone and are being watered frequently to ensure they crop well. Can’t wait! Our broad beans and, peas and brassicas are being watered on a weekly basis by a soaker hose. Our water butts are still full following good rainfall earlier in the week. 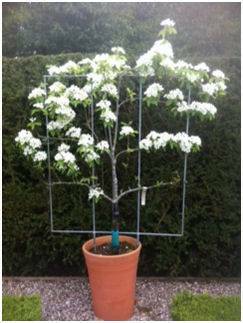 Also this week we will be taking time to admire the pear blossom. Our arch is looking amazing. 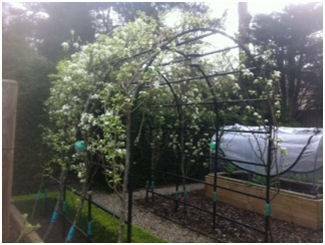 It is covered with beautiful white blossom and the bees are loving it. This week we will be harvesting spinach and calabrese. Recipe for steamed broccoli with anchovy butter. Lightly steam broccoli until tender (approximately five minutes). Mix anchovy paste with softened butter to taste and melt on to the steamed broccoli.